For seven years the Nile has not risen. The fields are dry, no man buries his neighbor…. Children weep…. All Egypt perishes. What was it that prevented the ancient Egyptians from finding the source of their great stream and perhaps learning how high it would flood in any given year? In its waters the Nile held many secrets. Fierce roaring cataracts, six series of them in a thousand kilometers (600 mi), guarded the river’s upstream reaches, and neither the pharaohs nor the power of Rome could conquer all the cataracts. And beyond the cataracts, deep within southern Sudan, lay “The Land of the Swamps,” a wilderness of trackless reeds that, even in the 19th century, marked the end of the known world. For hundreds of years, no one who followed the Nile into this swamp ever returned. The Nile’s source was only revealed a little more than a hundred years ago. In the heart of Africa, European explorers discovered a vast chain of equatorial lakes. And rising to nearly 5000 meters (16,000') above these immense lakes, on the equator between Uganda and the Congo but nonetheless capped with snow, were mountains known as the Ruwenzoris, often identified with Ptolemy’s “Mountains of the Moon.” Around their silent peaks they clasp the frozen vapors of distant oceans. Earth’s greatest single stream, the White Nile, begins upon them. But this was not the complete answer. Why did the river rise so mysteriously every summer to flood Egypt? Away to the east, as impenetrable to outsiders as the swamps, wild as the cataracts, Ethiopia towers above the deserts of Egypt and Sudan. And it was Ethiopia that held the ultimate secret, for here there was another Nile, the Blue Nile, more distant and mightier than even the White. orty-two years ago, in June 1964, I and my four-man Egyptian film crew set out from Cairo to capture on film the very last Nile flood that would come to Egypt. From the moment the flood began in Ethiopia, we followed its progress for 3200 kilometers (2000 mi). This had never been done before, and the CinemaScope feature documentary we produced, “Fountains of the Sun,” became the only filmed record ever made of this momentous event. We left an Egypt blistering in the summer sun, every city, town and village anxiously awaiting the last flood of all. In the sultry heat of Aswan, thousands of sweating workers toiled day and night, hurrying to complete six giant tunnels in time to carry the coming flood safely past the unfinished Aswan High Dam. The dam was being built to create a vast inland sea that would capture every future Nile flood. Instead of the river irrigating the land once a year, Nile water stored behind the new dam would irrigate Egypt all year round, and produce electricity into the bargain. Yet for all the wonders of technology the dam represented in 1964, the age-old question remained: Would there be too much water? Too little? Or just the right amount? All Egypt waited. 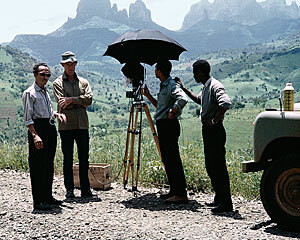 ountains of the Sun” was produced as an 83-minute feature film that showed briefly in several Cairo theaters. It then fell into obscurity because of disputes over distribution rights. 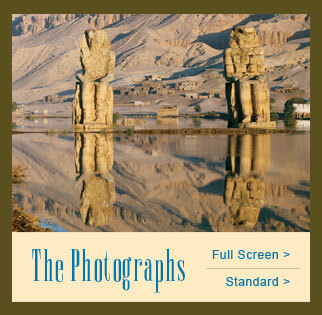 In 2001, it was nominated for inclusion in the “Memory of the World” register of the United Nations Educational, Scientific and Cultural Organization (UNESCO), which regarded it as “one of the most important films about the River Nile, …showing for the first time on the screen the sources and wonders of the White and Blue Niles.” The author hopes that a re-release may be possible in the near future. Much of Ethiopia is some 2000 meters (6400') above sea level, and its thin air can cause your heart to race, until you get used to it. From Addis Ababa, Ethiopia’s capital, we made our way in a four-wheel-drive truck up and down steep, Italian-built mountain roads toward the central high plateau. The summer winds of Africa had begun blowing in masses of storm clouds laden with moisture from the South Atlantic. They curled menacingly around gigantic mountain ridges. Millions of years of rain clouds had ground down these mountains into strange shapes. To capture this cloud spectacle, we began filming in time-lapse. Instead of a normal 24 frames per second, we reduced the camera speed to just one or two frames per second so that, when projected at normal speed, the power and wrath of the swirling clouds was visually enhanced. A week later, the sky over these strange mountains darkened further. Endless peals of thunder and immense flashes of sheet lightning accompanied the commotion in the sky. Nowhere else on earth does lightning flash and thunder roar so constantly as in the highlands of Ethiopia. Vicious streaks of forked lightning began to endanger man and beast alike: Every year hundreds of people die here from lightning. One day, near where we stood, a family’s straw hut caught fire and quickly burned to ashes. Now I knew why the very young children we met on our journey had small wreaths of leaves tied around their wrists and ankles, and older children had small leather pouches tied around their necks: They were amulets for their protection. We did not have long to wait before “the big rains,” as the Ethiopians call them, streamed out of the sky. Each time we attempted to film the deluge, we had quickly to hoist a large umbrella before we could get out our camera and CinemaScope lenses, hurriedly swathing them in sheets of plastic, as we ourselves huddled under another umbrella. Often there was no time for a tripod, and the camera rested on a shoulder or a head. During the big rains, it is the custom in Addis Ababa to hold concerts that go on into the wee hours of the morning. In a large shed, with the descending torrents beating an endless tattoo on the corrugated metal roof, we filmed a sequence of Ethiopian jazz music played by the Emperor’s Army band, their trombones and trumpets raised toward the sky as if to symbolically catch the pouring rain. We later cut these musical antics in with the lightning, thunder and torrents pouring out of the heavens. For three weeks on end, we worked in the drenching rain, driving across mountain plateaus, heading upriver further still to the source of the Blue Nile, passing boys of 10 or 12 sheltering from the rain beneath small, straw-peaked tents mounted on their head and shoulders, watching their herds of cattle, cows and goats. What tales, I thought, these young ones must conjure up as they watch their flocks in the rain. We stopped at the town of Bahardar, where we heard radio voices talking in Amharic and English reporting rising water levels that we knew were being transmitted also to anxious hydraulic engineers waiting in distant Egypt. With a name that means “roaring fire,” the Tisisat Falls must be one of the loneliest places on earth, little known and rarely seen by outsiders. Until the mid-20th century, they could only be reached by mule. Now a road got us to within a kilometer or so. Proceeding on foot through the rain forest, each person carried a piece of camera equipment. We first heard the murmur and then the roar as we got our first glimpse through the trees. Then we stood transfixed before the answer to the riddle that had baffled the world for thousands of years. There before us, pouring forth with the sound of thunder in one colossal fuming torrent, the Blue Nile was anything but blue, plunging from its source in Lake Tana above, down into a deep dark abyss that was the beginning of its great journey to Egypt. A boy of about nine summers appeared out of the bush and offered to hold the umbrella over the camera to protect it from clouds of spray floating off the falls. When we had finished our filming, we rested on the damp grass until our reverie was broken by a procession of six men emerging out of the bush, each carrying a stout stick over his shoulder, all guiding a solitary cow. A thief had stolen her, they said, and they were returning to their village from the local police station. By August, the most colossal Nile flood of the century was pouring out of Ethiopia. We followed the surge as it moved like a slow-motion tidal wave across the deserts of eastern and northern Sudan, into Egypt. Take from us our bitter pain! And the day we see thee will be a happy one. Children splashed their bare feet in the water. Elders waded in their shoes, “to get the blessing of the Nile.” Soon they would be sailing in boats to visit friends, as each village became an island; with no work possible in the fields, it would be the time for weddings. At another site, as the water rose and became stronger, babies a few months old, held by their tiny wrists, were being dunked, three times, in and out of the rushing water, and then handed back dripping to their delighted mothers. This was how it had been, every summer, during thousands of years of Nile floods. Next morning we ascended in the helicopter again, out of Luxor this time, and we circled over the flooding Nile basins, or lakes. Some of these were several miles long and they took a week to fill to a depth of two meters (6½'). We landed beside one still filling, and filmed. In each basin the water stayed for some weeks, drenching the land, slowly depositing the precious brown volcanic sediment it had brought down from the Ethiopian mountains. The water was then slowly led into another large basin, and so on until the remaining water flowed back into the Nile. In the soft sediment left by the floodwaters, the fellaheen, the farmers of Egypt, set about planting their crops of beans, wheat and barley as they had done for thousands of years. But after this year, all would change. The Nile flood still comes, of course, but no one in Egypt sees it. Instead, it is contained in the immense inland sea called Lake Nasser, behind the Aswan High Dam. Here, Nile water collected year by year is led along neat narrow canals as unobtrusively as water coming out of a bathroom tap. But in 1964, the oldest problem of all remained: No one could tell exactly when the flood would reach its peak. For three weeks at the height of this particularly vast flood, it was touch-and-go whether Cairo and large parts of Egypt that were normally not flooded could be saved from catastrophe. Hydraulic engineers stationed along the river in Sudan and Egypt worked day and night to try to control the surging waters. The flood reached to within a few inches of the top of the six tunnels meant to lead the flood safely past the unfinished High Dam. Ramses ii’s 3500-year-old temple at Abu Simbel, in the process of being moved to higher ground, was threatened. Basements in Cairo filled with water. Perimeters of concrete were hurriedly built around sewage and telephone conduits. Immense sheets of water began flowing up out of cracks in even the paved streets. This last Nile flood was a reminder that the river could still bring both life and death. Then, a few inches short of disaster, the river ceased its rise. The river having reached its anxiously awaited peak, preparations were made for the annual ‘Procession to the Nile.’” In 1047, the visiting Persian scholar Nasir Khosrau left a particularly rich description of the annual Fatimid procession celebrating the Nile’s inundation of Egypt. For this great occasion, he wrote, the caliph went personally to his treasury to select his symbolic regalia: parasol, turban, scepter and sword. The sound of the palace band, which would accompany the procession, was so enormous that for three days before the event, massed drums and trumpets played continuously in the palace stables to accustom the animals to the noise. The job of decking out the processional route fell to the jewelers and tailors of the city, and this, too, always took three days and nights to arrange. New Zealand-born filmmaker, photographer and writer John Feeney was among the early developers of wide-screen and large-format film techniques. He has contributed to this magazine since 1973. He divides his time between residences in Cairo and New Zealand. This article appeared on pages 24-33 of the May/June 2006 print edition of Saudi Aramco World. Check the Public Affairs Digital Image Archive for May/June 2006 images.